Supported by Dermot Doherty and his son William, Vereker was joined by a formidable squad for the maillot violet in Richie Gallagher, Fergal May, John McGettigan, John Malone, Michael Moran and James Quinn. The team raced nine laps of the Cork course, taking in one savage climb on Kerry Road on each round to cover more than 95km. After hours of dramatic racing, Wexford Wheelers’ Simon Lambert sprinted for gold in the hilly race with Vereker finishing fourth, his bike and body somehow still going after two falls – he could be forgiven for feeling hard-done-by as he looked up at the podium. Vereker said: “Thanks everyone. Good day for the club. Am slightly disappointed not to have got on the podium, but, after hitting the deck twice in the race in minor incidents, will take it. Though Vereker was modest about his efforts, his team mates and support team were not. Manager Dermot Doherty explained: “We heard on race radio ‘two riders down, one Tiernan’s’, as we came around a corner to see Martin on the ground. “Before I could even slow the car, he was up, checked his wheel, clipped in and back up. But more, he starts at least 50m behind the back of the bunch going up a nasty climb. It was son William’s first experience of working on the support team and Dermot was effusive in his summary of their role and the team’s. Gallagher came in ninth and McGettigan was 25th in a huge field. Both were quick to praise the Dohertys for their in-race support. 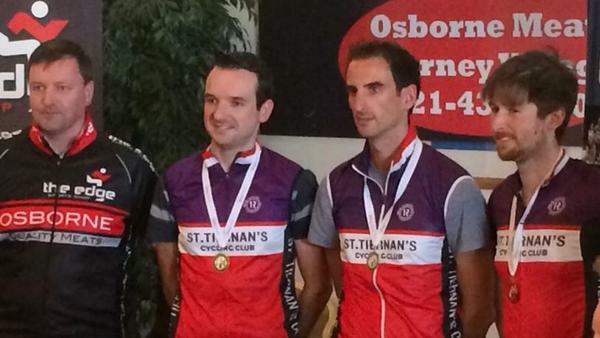 No Replies to "St. Tiernan's takes team title at A3 National Championships"